I had wanted to try out so many cookies and cakes for this Christmas, but the last couple of weeks had been so busy, that I couldn't make much. 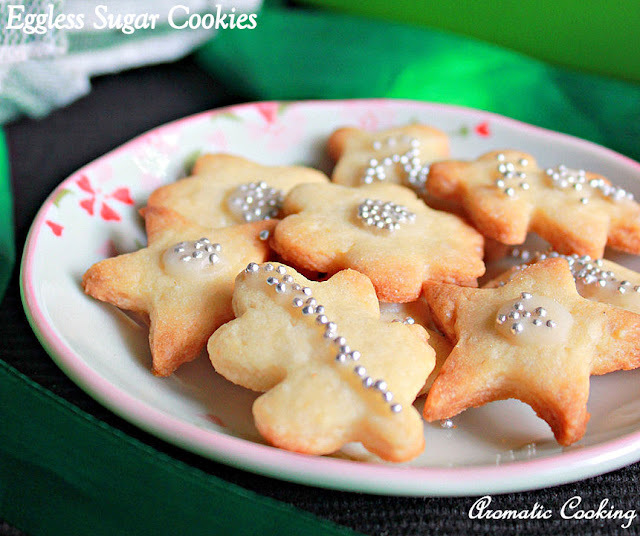 So with barely 10 days to Christmas, I thought, I'll try out at least some simple cookies and these Eggless Sugar Cookies falls perfectly in that category. 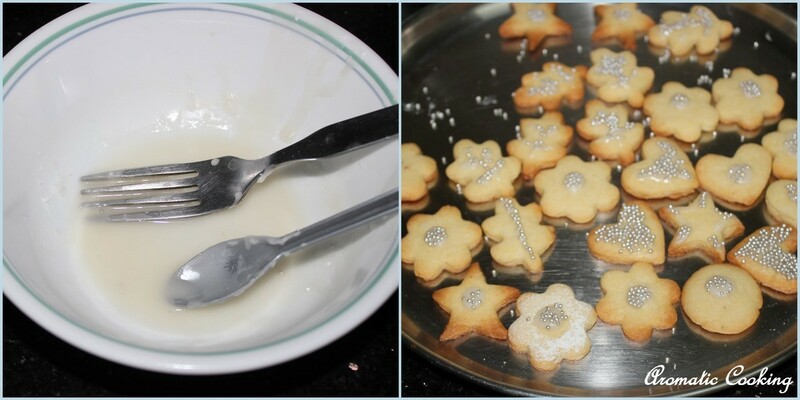 It's the basic cookie that anyone can make and though decorating the cookie is totally optional, I did a little bit of it, just to make it a little more glittery and in mood with the holidays..
Take the butter and the sugar and beat it well into a creamy mixture. Sieve together the flour and baking powder and keep. Add the flour mixture, salt, vanilla extract to the butter and mix it well. Then add 3 teaspoons of milk and make a smooth dough, if needed add another 1/2 teaspoon. Keep the dough between two sheets of wax paper, roll it out into a 1/4 inch thick disc. Using a cookie cutter, cut out the cookies, remove the cookie shapes, then bring together the dough that is left out while cutting out the cookie shapes, roll it out again and repeat so that all the dough is used up. Keep the cut cookie shapes on a lined baking tray, refrigerate for about 15 minutes. Meanwhile, preheat the oven to 180 C and bake the cookies for 10 to 13 minutes. Remove it as soon as the cookie edges starts browning a little. Let it cool for about 3 to 5 minutes, then remove from the tray and cool it completely. 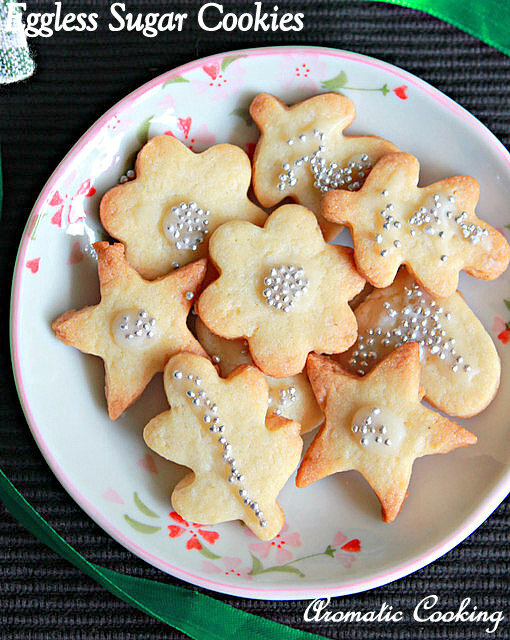 For decorating the cookies, mix together all the ingredients given for the icing, apply a little on top of the cookies and stick the glitter balls on them, let it cool and dry completely, then store them in an air tight container. You can use 1/2 and 1/2 mixture of whole wheat flour and all purpose flour. Make sure to roll out the dough evenly, so that all the cookies are of the same thickness. Check them from 9 minutes, remove them when they start turning golden at the edges. Leaving it longer will make the cookie more crispy. I have just coated the cookies very lightly with the icing, but if you want to cover it well, then use double the quantity. They are very pretty with those sugar pearls. Yumm they look so inviting and festive! cookies look super yummy!! love the cute sprinkles! !